I cannot resist an authentic market. I generally avoid the purpose-built, flourescent lit, orderly rows often seen in the most touristy areas of most places, in favour of community-based markets that grow organically in back alleys, in tiny green spaces and on any sliver of pavement not otherwise occupied. 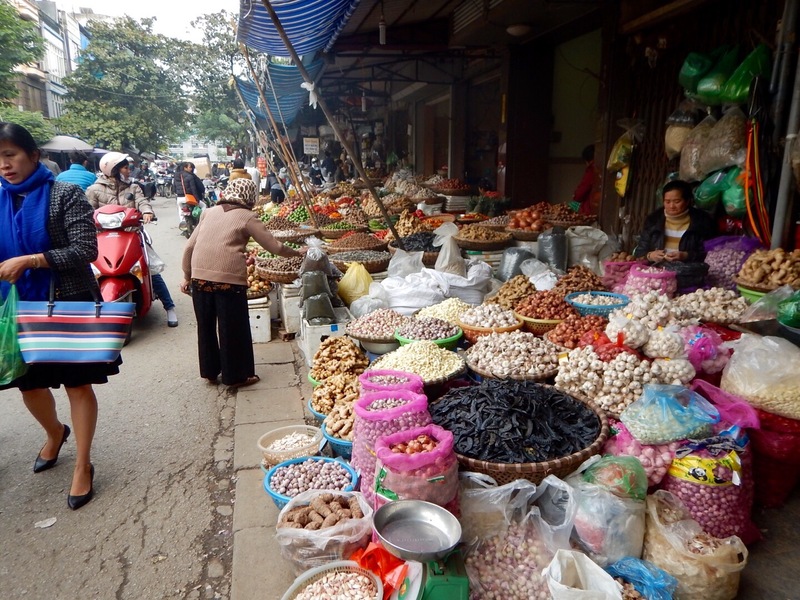 On one of my strolls through the Old Quarter of Ha Noi I came across an entirely different kind of market. 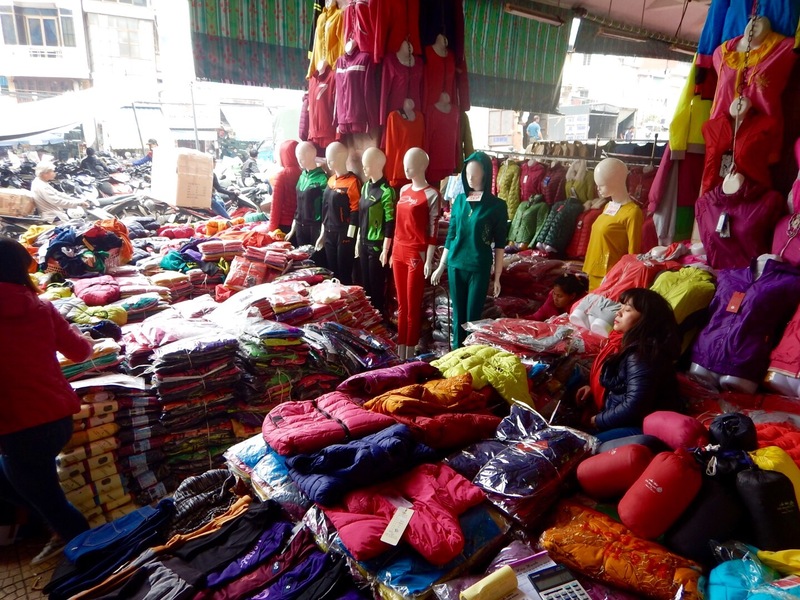 The Dong Xuan Market might be one of the oldest purpose-built markets in Ha Noi, built during the French occupation in the late 1800’s. It’s been renovated a few times, most recently in 1994 after a major fire. 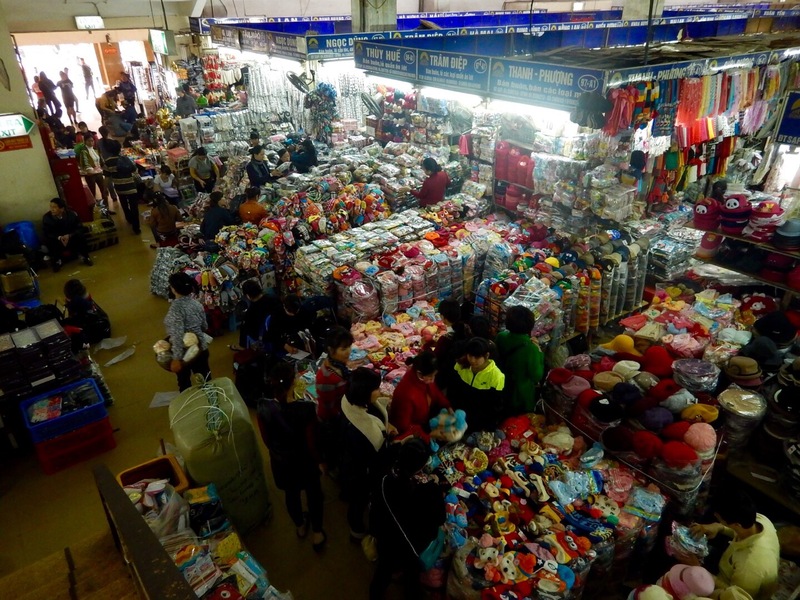 These days this building, somewhat resembling an airplane hangar is a wholesale market stacked to the rafters with everything from shoes and clothing, to hardware and kitchen supplies, perfumes and spices. I think you can find anything at all here, much of it baled into large lots. There are many, many, many vendors each staking out their eight foot slice of floor space, and then maximizing it by stacking goods as high as gravitationally possible. The view from above the ‘hat and backpack’ section. I was surprised to see huge bundles of ski jackets, mittens and gloves, and wool beanies or toques. This in a country whose lowest temperature averages 17 degrees. It might be hard to tell from this photo but it’s the socks and underwear section. Everything is bagged in what looked like lots of fifty or more. I mean you just can’t have too many pairs of undies. Space is at such a premium that very little of it is given up for walkways. I had to squeeze sideways through some of these ‘aisles’ and I tried to always keep within sight of an exit. 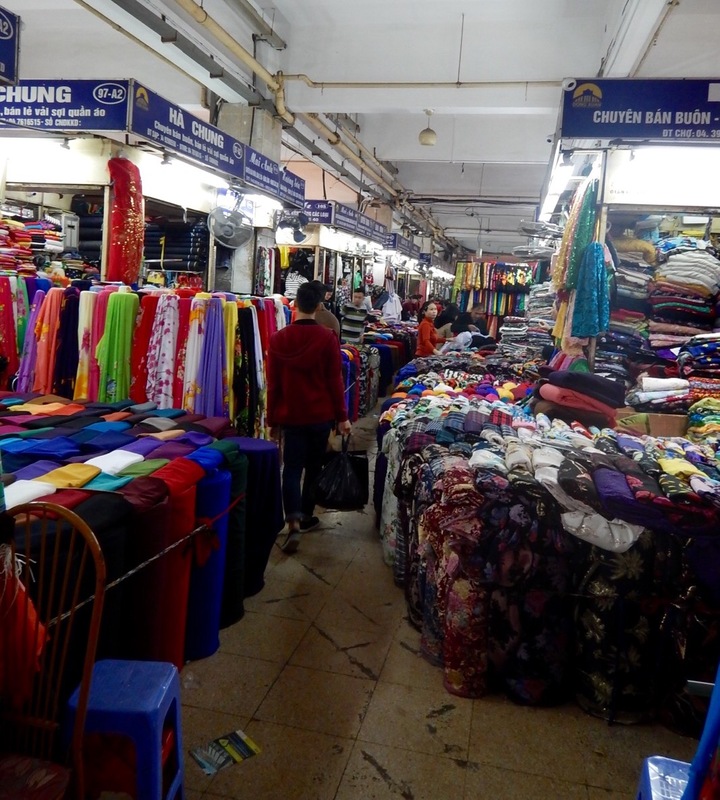 It’s easy to get lost in some of these huge spaces where one section looks much like another, and the thought of a fire in this market was never far from my mind. I found some relief on the second floor of the market where it was at least possible to walk normally through aisle after aisle of shimmering bolts of fabrics. The men’s clothing here seems like it might be stacked on display tables but that’s not the case. The stacking starts on the floor and fills the whole space. I think there might be sweaters and jackets in the middle of this lot that have been there since the 70’s! Much of what you see sold by street vendors or in charming shops comes from here so you might be buying what was once at the bottom of one of these huge plastic bins. 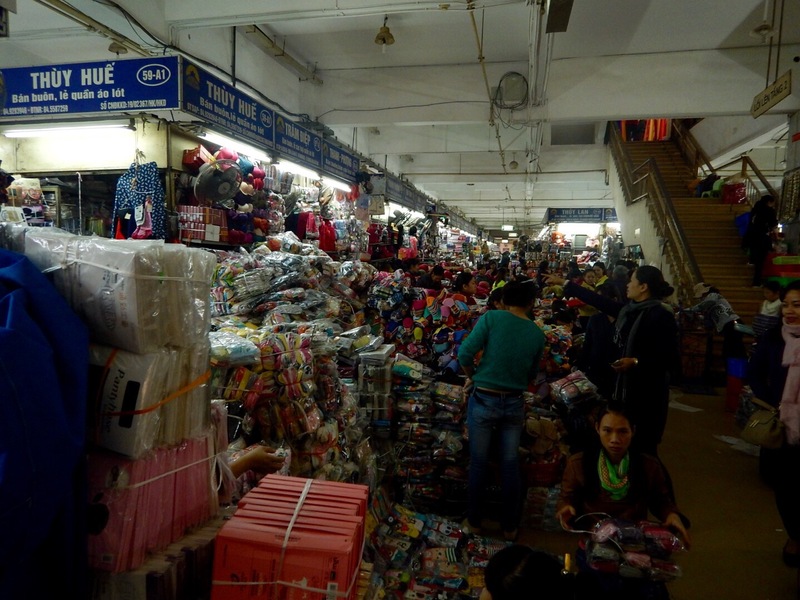 After visiting Dong Xuan market I read that that all the soft goods in the market come from China. Which explained a lot. My impression is that this single market contained an overwhelming volume of goods that would likely never be bought or used. The term ‘dumping’ came to mind – the practice of unloading unwanted merchandise into foreign countries at significantly lower prices than the goods sell for in the originating country. 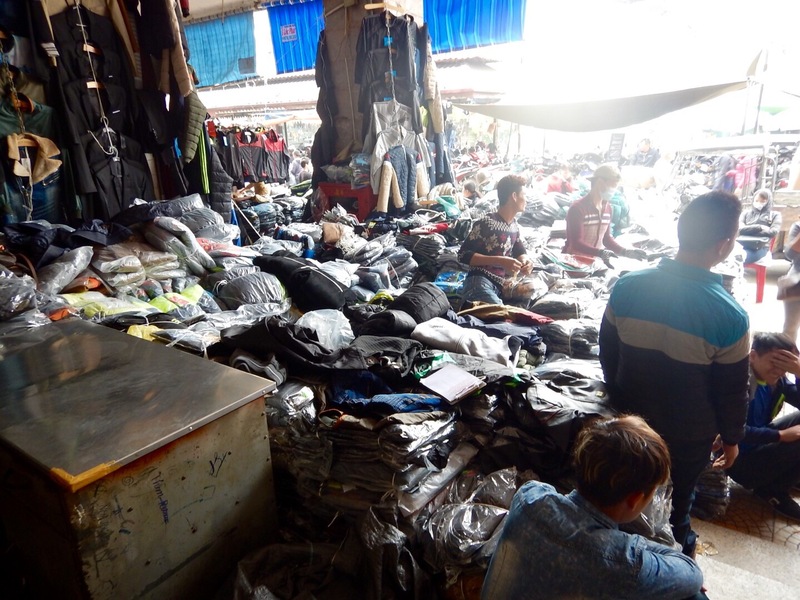 Dumping typically disrupts the economy in the nation being dumped on, preventing that country from getting adequate prices for their own manufactured goods. 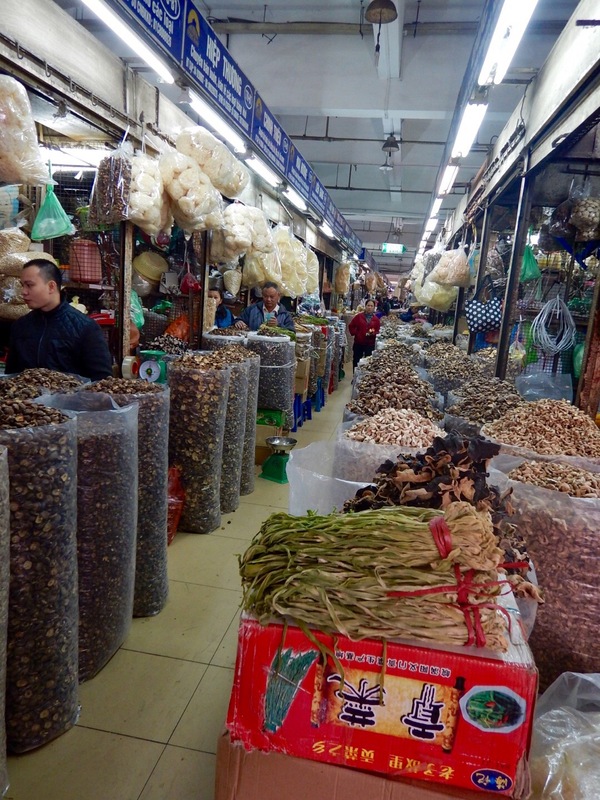 The streets all around the over-stuffed Dong Xuan market were filled with more traditional goods in quantities much more digestible and appealing. 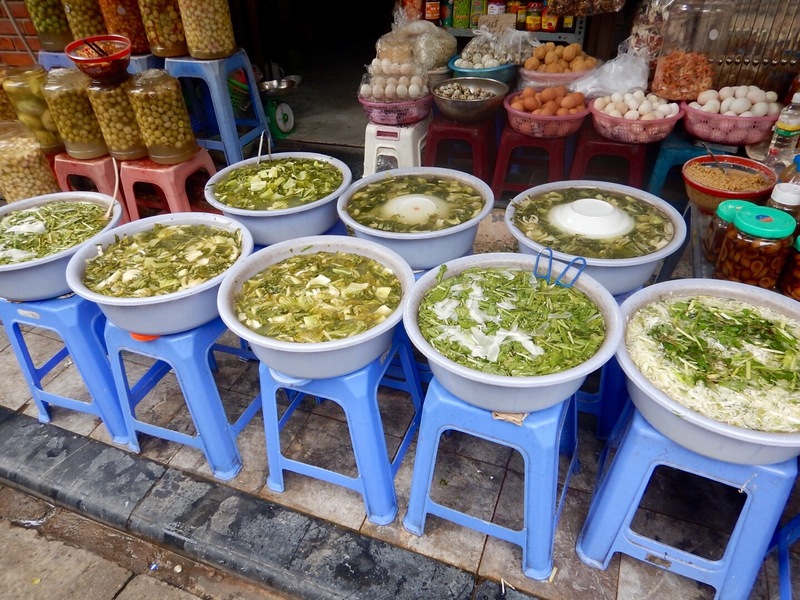 After the sheer volume of goods in Dong Xuan it was completely lovely to again be strolling the street scene and to interact with vendors of more local fare. 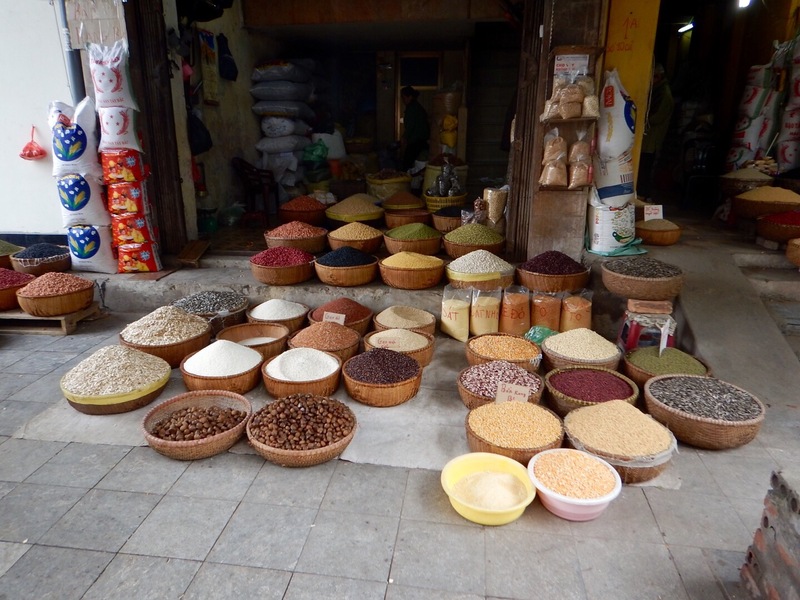 I was unreasonably delighted with this little display of perfectly arranged rice, beans and spices. These are all different combinations of greens and spices, bought in plastic bags to take home and add to your evening pho or noodles. 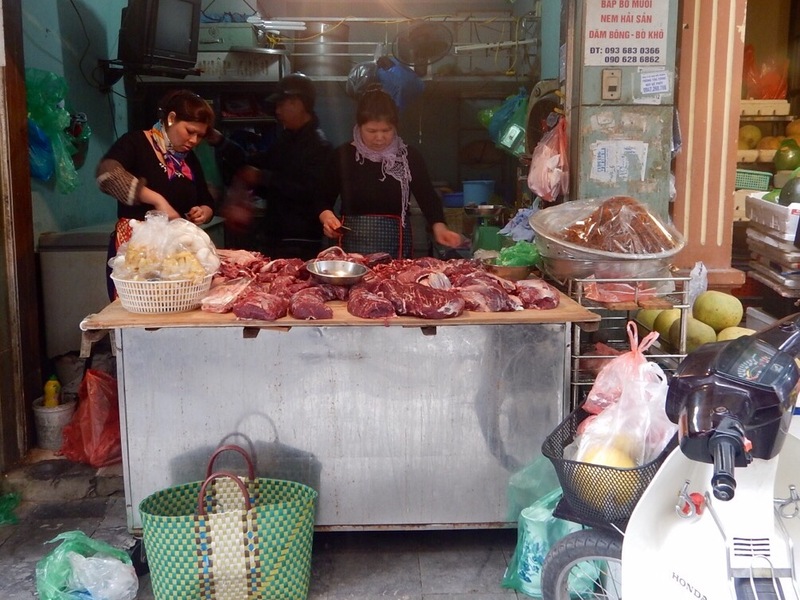 Beef is not particularly plentiful or tasty in Viet Nam. 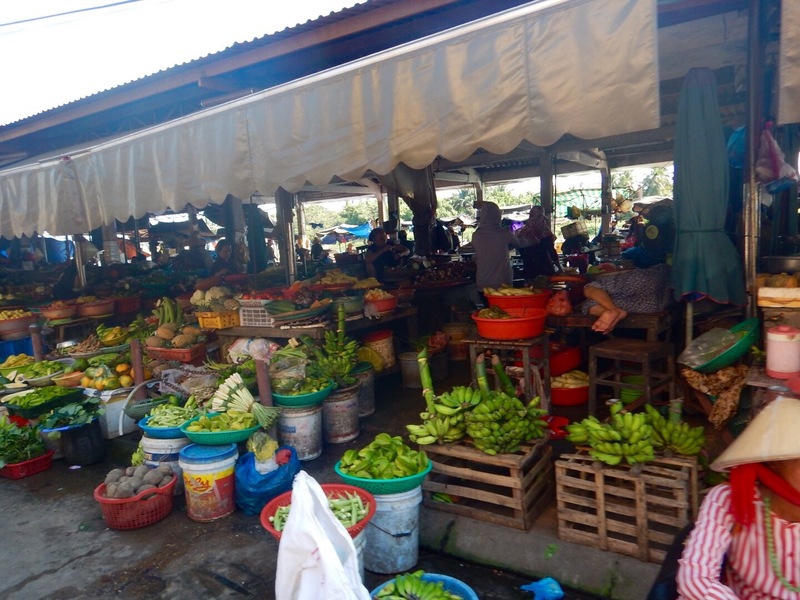 There’s limited pasturing and it tends to be tough but it can be found at specialy stalls like this one. Chicken or other types of poultry and pork are the most common meats in most dishes. …and all kinds of sea food, much of it unrecognizable (at least to me) and an awful lot of it still alive. 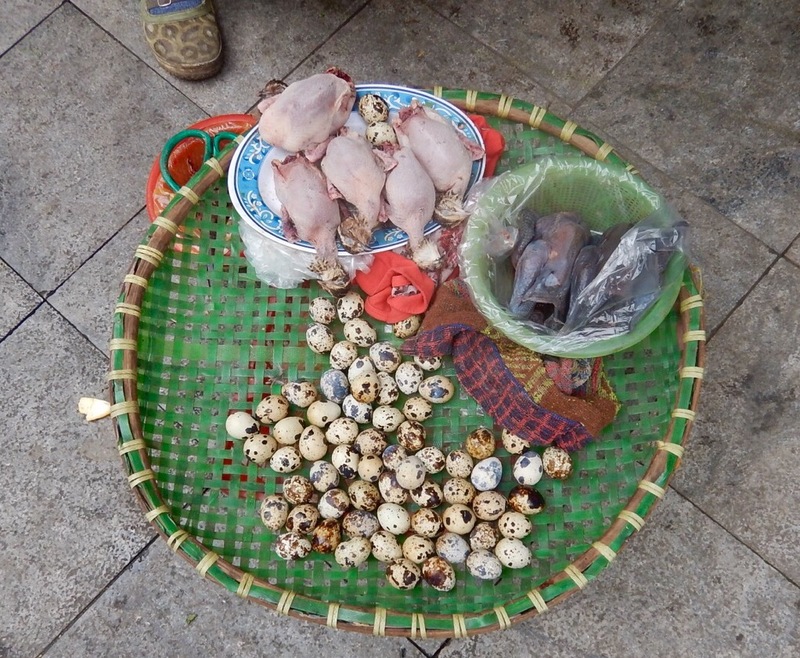 I ate quail eggs often – in salads, dumplings and added to pork buns. But I resisted the street quail – fried-to-order on a little brazier at the curb. Thanks Terri – What a nice treat to have your blogs come to my inbox during the holidays! Hope you had a very Merry Christmas & Happy New Year! Cheers! okay now I have pictures………wow………..thanks This is just incredible! I would love to see that market. Your photos tell a huge story as well.